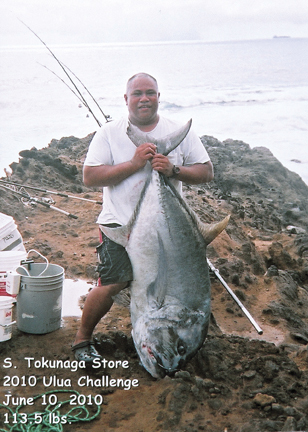 Max Pajo landed his 113.5-lb ulua at an opportune time... during the 2010 S. Tokunaga Store Ulua Challenge! He caught his fish using an 11-foot Sabre pole, 646 Newell reel and 80-lb test Maxima line. There's no doubt that he scored a lot of great new equipment with his catch!